He has been dead for one hundred and twelve years but James Abbott McNeill Whistler is making a star turn in the Berkshires this summer, with two exhibitions, one in the Lunder Center at the Clark Art Institute and another at the Williams College Museum of Art, both located in Williamstown, MA. 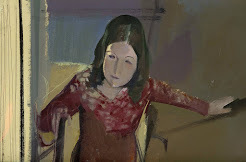 This is no small thing when one of the paintings, the one at the center of the Lunder exhibition, is not only Whistler's most famous painting but is also the most famous painting by an American artist that is not in the collection of an American museum. 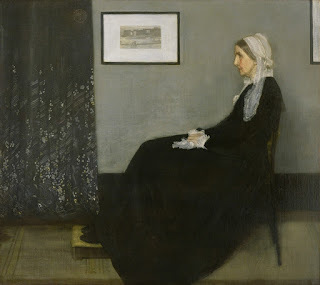 Whistler's Arrangement in Gray And Black No.1, commonly referred to as "Whistler's Mother" was purchased from the artist by the French nation in 1891. Painted in 1871, the picture was exhibited at Philadelphia in 1882 but no American had the foresight to buy it. Interestingly, the French art critic and dealer Theodore Duret who was an early supporter of Whistler's work was also an advisor to the American collectors Henry and Louisine Havemeyer, whose collection became one of the treasures of the Metropolitan Museum of Art. 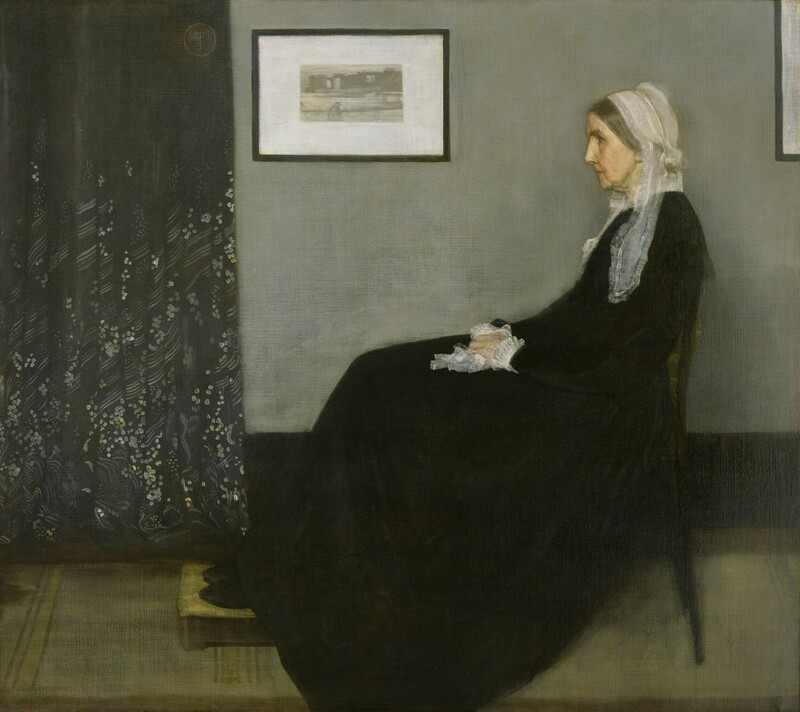 If only is a thought that hangs in the air whenever I think of Whistler's painting of his mother. This may have been one of the things Sadakichi Hartmann had in mind when he wrote of Whistler, “America really did nothing for him and he did nothing for America." Sadakichi Hartmann was not being tendentious; an astute critic of modernism in all media, he was well aware that painters could have seen this with their own eyes but they needed photography to notice the phenomenon. As an early critic writing about photography as art for Alfred Stieglitz’s Camera Work, Hartmann was always attentive to the influence of photography on painting, forthright in pointing out the connections at a time when the subject was only discussed sub rosa. Even an artist like the Belgian Fernand Khnopff, who made no secret of his use of photography in his pictures, found that critics were unprepared to assimilate this new method into their discussions. Was Whistler interested in the narrative uses of painting? Not much. For an answer, consider his most famous painting: Arrangement in Gray and Black No. 1: Portrait of the Artist's Mother. Notice how the outlines of the black dress worn by Mrs. Whistler cannot fit the proportions of an average body; as painted, shr has the head of a petite 19th century woman and the body of a modern basketball player. This artfulness only makes it easier for viewers and critics to supply the influences and the list of candidates is long: Rembrandt for darkness, Courbet for luminosity, Japanese ukiyo-e prints for flatness, photography for focus. Hartmann's assessment of what makes a Whistler interior so mesmerizing has lost nothing to time, changing tastes, or competing theories: “…there are many horizontal lines in its composition but the diagonals of the figures shape our response. In Whistler's interiors, the background is usually a straight wall: he rarely indulges in perspective." The Whistler Book is still worth reading today. Its style may be somewhat dated but it is clear and graceful, as you would expect from a writer who understood the mutability of taste. Close as he was to his subject in real time, Hartmann needed no over-arching theory to justify his interest or make his career. Indeed, Sadakichi Hartmann was so full of ideas that he needed a pen name - Sidney Allan - to get them all into print. For more about Sadakichi Hartmann. 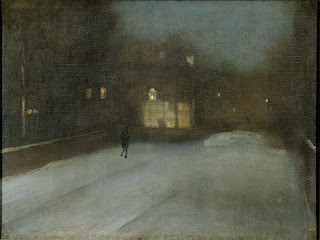 For more information on the exhibitions, visit Clark Art Institute and Williams College..
To read The Whistler Book by Sadakichi Hartmann, Boston, The Page Company: 1910. 1. 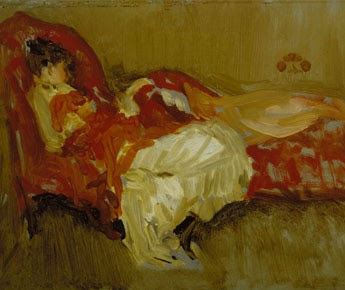 James Abbott McNeill Whistler - Note In Red a/k/a The Siesta, before 1884, Terra Foundartion, Chicago. 2. James Abbott McNeill Whistler - Nocturne In Gray And Gold - Chelsea Snow, 1876, Fogg Art Musem, Harvard University, Cambridge, MA. 3. James Aboot McNeill Whistler - Arrangement In Gray And Black No. 1: Portrait Of The Artist's Mother, 1871, Musee d'Orsay, Paris.